Ack, a spider, kill it with fire! Riot Games has been very well known for celebrating holiday events in League of Legends with a great deal of flair. This Halloween seems to be no different with the announcement of The Shadow Isles, a newly revealed area of the world of Runeterra. It's not just that, either -- this update brings a few more scary festivities with it. A new champion will also release with this update, dubbed "Elise, the Spider Queen." She will be directly related to the Shadow Isles, fighting under their banner. Not much else is known about her yet beyond this small bit of backstory and a few quotes of hers. Also representing the isles are existing champions Karthus, Mordekaiser, Hecarim, Yorick, and Evelyn. It's interesting to finally see some of the characters who had never really been appropriated to any of the existing nations -- such as Mordeekaiser, who appeared out of a dark alley randomly one day -- finally get a bit more to their origin. In addition to this, Elise, Hecarim, Maokai, and Twisted Fate will be receiving some haunting dreads with a Halloween-themed skin each. For the first time, there will also be new skins for the vision-granting items known as wards. 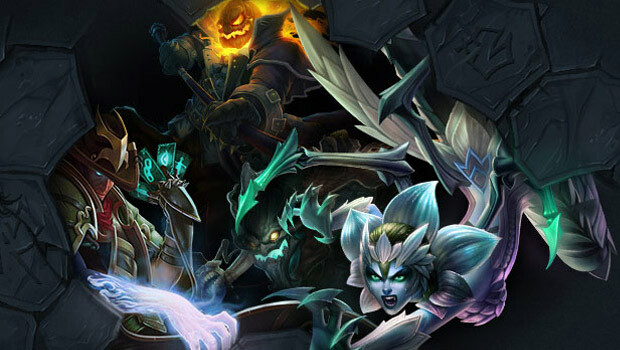 Details about these "ward skins" will be revealed at a later date, as well as details on new Halloween-themed summoner profile icons. As far as the Shadow Isles themselves, it's currently unknown what role outside of lore they will provide. It's possible that there might be a new map, although reps from Riot Games have previously stated that they were not going to be focusing on new maps anytime soon. It's likely this could be the new Halloween-centric skin for the Summoner's Rift map. In any case, you can check out the promo site for The Shadow Isles here.